Earlier this year we honored Bruce Bento as February’s Mentor of the Month. Now he is back for his One Million Mile Jacket! Bruce joined TransAm Trucking in December 2009. When the New Year rolled around, Bruce decided to make the switch to Independent Contractor. He’s been moving down the road with TransAm Trucking ever since. It’s not work. It’s play. Trucking was not Bruce’s first profession. He worked at IBM for 30 years before joining TransAm Trucking. However, during his Jacket ceremony, Bruce confessed, “I wish I did this (truck driving) right out of high school. […] As long as I’m driving, I’m happy. This is fun for me.” Seeing the country from his truck’s cab and helping to drive America’s economy through freight transportation, is not work to Bruce. If you ask him, he will tell you he has not worked since he started truck driving. He is earning a living doing what he loves. Bruce greatly respects the trucking industry. He drives the product across the country, but he appreciates that TransAm’s office staff helps to find the loads and keep him moving. “It’s a team effort.” During his Jacket ceremony, Bruce thanked the Driver Managers and Planners who help keep him rolling down the road. He made a point to shake hands and individually thank the people with whom he regularly interacts. We gathered to honor Bruce, but he turned around and honored us. 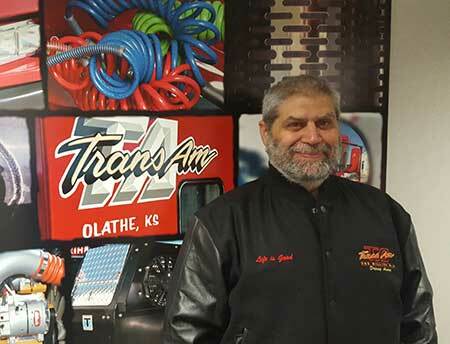 We are truly thankful to have Bruce as a TransAm Trucking representative. Bruce is a dedicated businessman with a great sense of humor. Things might not always go his way, but “when life gets stupid, you got to laugh.” Congratulations, Bruce, on your One Million Mile Achievement! We look forward to working with you and your business during the next million. Thank you for choosing TransAm Trucking.